In this episode, Alycia interviews Sabina. 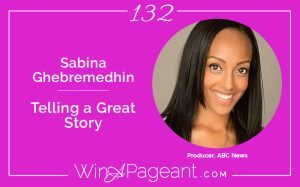 Sabina is an Emmy Award winning television producer for ABC News. She currently serves as the West Coast Editorial Producer for ABC News Good Morning America where she is responsible for the network’s big breaking news stories. In 2015, Sabina was honored with the ABC News Division’s MVP (Most Valuable Player) award. She has worked on groundbreaking stories including the Pope Virtual Audience, the life & death of Michael Jackson, Kobe Bryant’s Retirement, Super Bowl 50, San Bernardino Massacre, Paris Terrorist Attacks, the American Heroes in the Paris Train Attack, Boston Bombing, Sandy Hook Elementary Massacre, The Missing Three, Santa Barbara Shooting, Oregon UCC Shooting, the Donald Sterling Scandal, the Ebola crisis, the protests in Ferguson, Missouri, and many more. In addition, she has extensive experience covering red carpet Award Shows – interviewing celebrities at the Oscars, ESPY’s, Emmy’s, American Music Awards, Grammy’s, Golden Globes and the Billboards. Sabina’s experience includes serving as on-air talent in her native country of Sweden, for Swedish Television as well as producing positions at local stations WGN, Fox and ABC Radio affiliates in Chicago.